This is a surprisingly smooth, easy, and completely enrapturing read. It's, in fact, incredible. Non-fiction, as educational and interesting as it may get, tends to get pushed to the last in my reading list because, let's face it, it's kind just more boring. 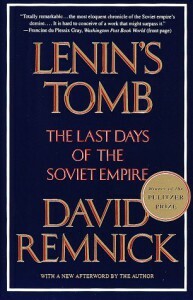 Remnick is not only a compelling and honest writer, ut everything that he writes about, all these people from the USSR, he's writing from first-hand experiences! This doesn't read quite like fiction, but no really like straight up non-fiction, either. It's a fascinating weave of stories of people who he met and spoke with and attended events with that create this insanely insightful history of the powers of the Soviet empire. In fact, I would probably even re-read this. And that's not something I've ever done before with non-fiction. Remnick, you're amazing!